The NHL Central Scouting Service released its Midterm Rankings on Monday, Jan. 10 and highlighted eight Minnesota High School players - but only one of those eight is a goaltender. Lake of the Woods senior Alex Lyon is the only Minnesota High School player in the goalie rankings. Lyon - ranked No. 20 - is currently third in Minnesota this season in save percentage with a .942 percentage and has played all 12 games for Lake of the Woods (6-5-1) this season. The senior goaltender also played for Team North in the Upper Midwest High School Elite Hockey League and led the league in save percentage with a .930 percentage in 14 games. The Lake Conference is well-represented in the rankings as five of the eight Minnesota high school players were from the newly remodeled conference: Wayzata's Mario Lucia (No. 30) and Tony Cameranesi (No. 160), Edina's Max Everson (No. 81) and Steven Fogarty (No. 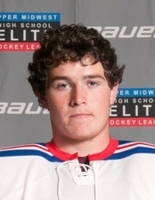 132) and Eden Prairie's Kyle Rau (No. 176). Holy Angels' Joseph LaBate (No. 60) and Stillwater's Neal Goff (No. 179) were also in the rankings. All eight players played in the Elite League during the fall of 2010. Everson and Lucia also played for the U.S. National Development Team Program [Under-17 Team] in the fall.